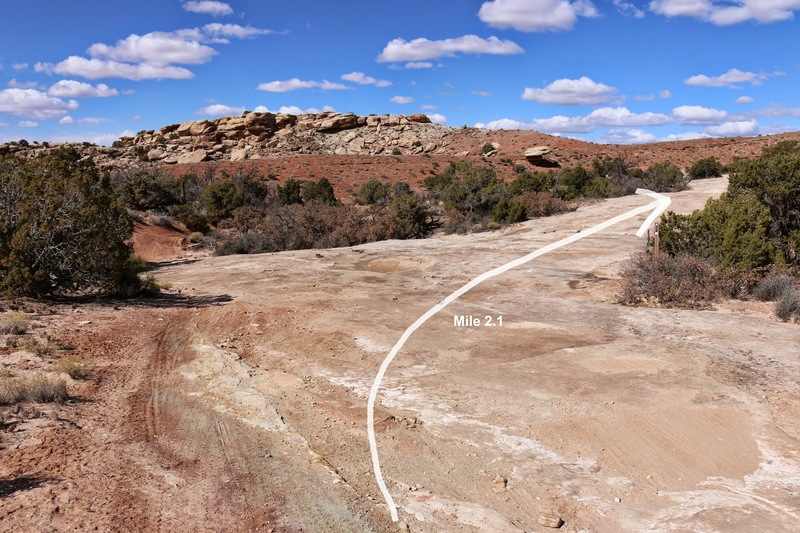 The Klondike Bluff Road is a multi-use route, first used by miners, in the Klondike Bluffs Area north of Moab, Utah. The road begins off of Highway 191 and crosses the bluffs where it drops into the Salt Valley and connects to the road there. Portions of the route that pass over long stretches of slickrock don't resemble a road at all. Numerous dinosaur tracks can be found in several places along the road. 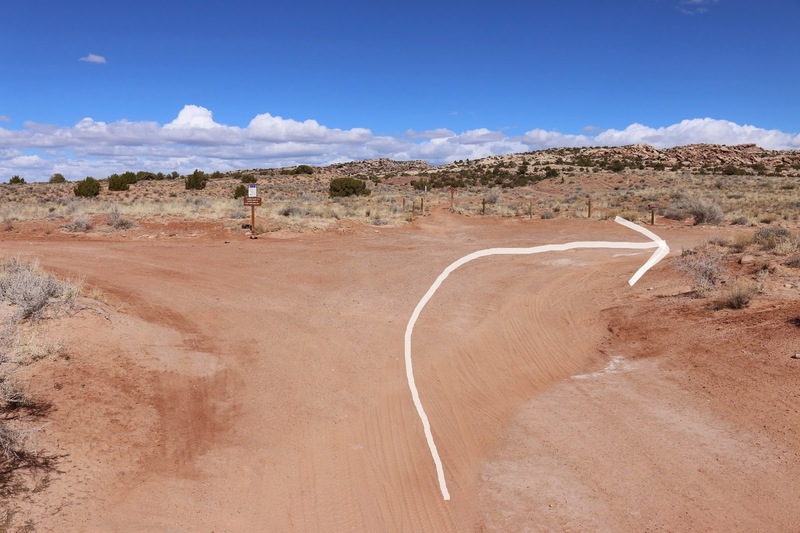 For this post we begin at the Klondike Bluffs trailhead and followed the road through a canyon and up the slickrock, past the dinosaur tracks, to a turnoff that leads to a hiking only trail that reaches about a quarter mile into Arches National Park and ends at a scenic overlook. 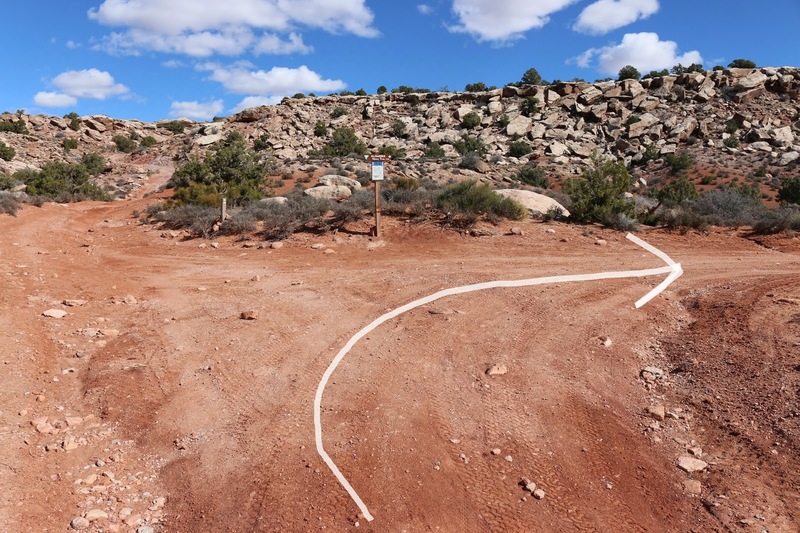 To get to the trailhead either drive 17 miles north of Moab or about 14.1 miles south from Crescent Junction on Highway 191 and turn east at the Klondike Bluffs sign. From the turnoff on Highway 191 it is 2.7 miles to the trailhead. The road is rough in spots and best avoided after a heavy rain. We have driven the road in a passenger car but something with a little more clearance is preferable. There is one fork in the road a short distance before the trailhead where you will want to stay to the left. 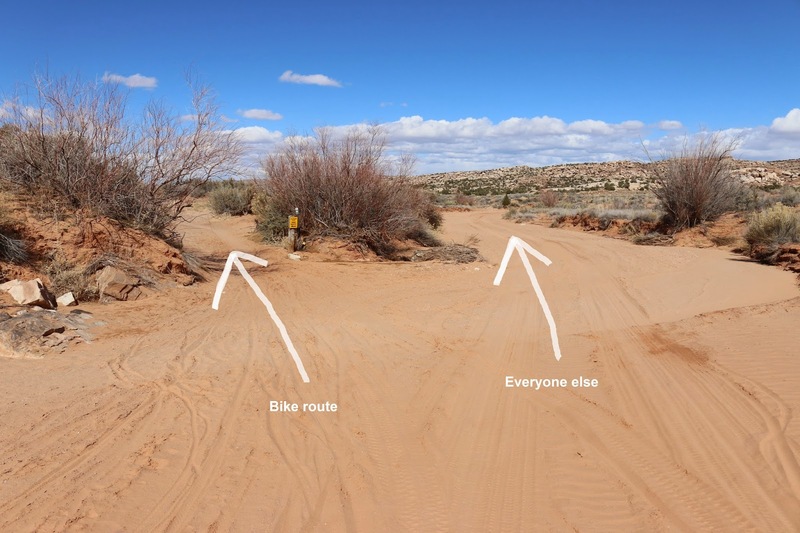 The Klondike Bluff Road crosses the cattleguard and after a short distance it enters a sandy wash. Mountain bikes and hikers can take a side trail that avoids most of the deep sand but everyone else must stay in the wash. The road comes to a 4-way intersection after leaving the wash where the Copper Ridge Road goes to the left, the Dino-Flow trail is straight ahead, and the Klondike Bluff Road continues to the right. The road continues up a shallow canyon where only a high clearance 4x4 will be able to go. As the road comes out of the canyon it transitions to a massive expanse of slickrock where white stripes of paint point out the route to take. The dinosaur tracks begin appearing around the 1.8 mile point from the trailhead. Watch for the depressions surrounded by rings of rocks. Numerous tracks can be found over the next quarter mile or so. Watch for the trail signs and at mile 2.1 be sure to stay to the right. Stay to the right again at mile 2.3. For those that want to see a few more dinosaur tracks there are some nice ones to the left about a hundred yards or so but that portion of the trail is open only to hiking and mountain biking so motorized vehicles will need to park here and walk the short distance. For about the next mile the road is a seemingly endless stretch of slickrock. 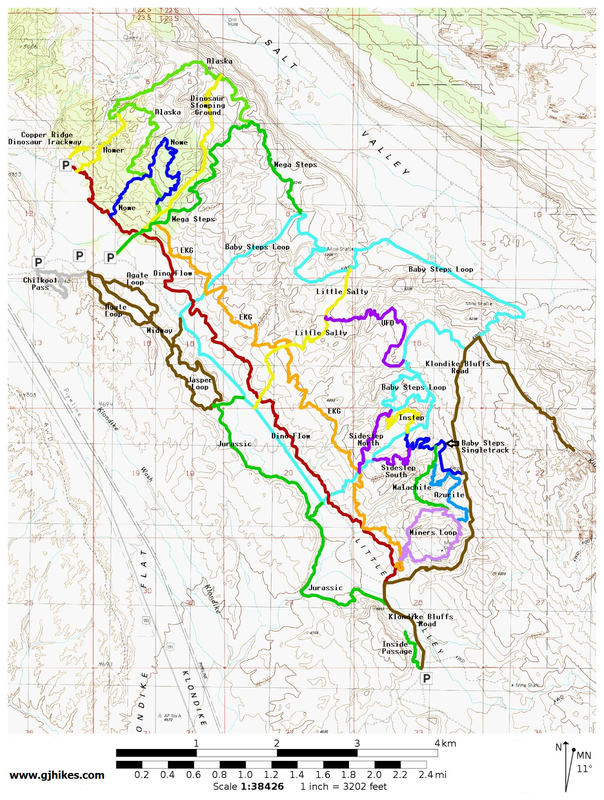 The Baby Steps Loop reconnects to the Klondike Bluff Road at mile 3.33 and continues following it into the Salt Valley. For this post we take the right hand turn at mile 3.5 and follow the sign for the Klondike Hiking Trail. Motorized vehicles can follow the road to mile 4.21 and begin hiking. Mountain bikes can go another 100 yards to the boundary for Arches National Park and hitch their ride at the bike rack that is there. From here everybody walks the last quarter mile to the overlook area. The trail follows an old road for most of the way and then the trail picks up a cairned route up the Navajo slickrock to the overlook area. Upon arrival there isn't anything that says 'this is the place' but rather the cairns simply end and you are left to wonder around and enjoy the views. We ventured down as far as we dared to see if we could get a peek at the trail to Tower Arch. We didn't spot that but we could make out the tops of the infamous 'Marching Men' monoliths. We rode our mountain bikes on this one and seeing how it is practically all downhill back to the trailhead we made a quick trip of it. On this trip we met other mountain bikers, dirt bikers, hikers and a pickup. Everyone seemed to be having about as much fun as we were. With great views and lots of dinosaur tracks the Klondike Bluff Road has a lot going for it. If you would like to see it for yourself then all you have to do is 'Take a hike'.